If British lawmakers approve a divorce deal they have twice rejected, they can leave the European Union on May 22. If they reject it, they must plan an alternative by April 12 or fall off the same no-deal cliff that evening. May told reporters that she was satisfied with the extension. She said it was now “very clear” what the options and deadlines are for British lawmakers. “What the decision today underlines is the importance of the House of Commons passing a Brexit deal next week so that we can bring an end to the uncertainty and leave in a smooth and orderly manner,” she said. May appeared to be relatively upbeat and matter of fact, and she took pains to reach out to lawmakers. 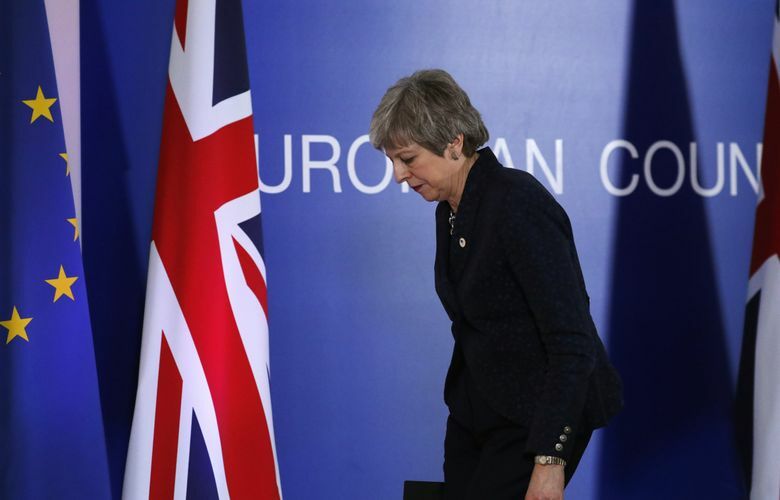 Gone was the hectoring, accusatory attitude of the night before, when she lashed out at Parliament and said it was lawmakers’ fault that Brexit was being delayed. But European leaders made little secret that they were fed up. Leaders felt May was so removed from political realities that one European diplomat said her assessments were “a bit like coming from another planet.” The official and others spoke on the condition of anonymity to recount the talks. In footage of the EU leaders greeting one another in Brussels before settling in for business, May joked with Luxembourg’s prime minister, who just minutes before had threatened to cast Britain out of the EU without a deal. She exchanged a tense and unsmiling double-cheek peck with European Commission President Jean-Claude Juncker, with whom she has tangled and who has taken a particularly hard line against her. One leader after another went around a round table to hammer May about her political strategy, her preparations for a no-deal departure and why she wanted three months more. On each question, they found her wanting, diplomats said, after she ate up much of her opening discussion time to read off a letter that leaders had already seen the day before. In all, she was grilled for nearly two hours – an eternity in the tightly choreographed world of high-stakes summits. “You could feel the patience running thin,” an official said. After she was dismissed from the room, leaders talked and talked, disinviting May from dinner of duck a l’orange to keep hammering out a deal. The Bulgarian ambassador to the European Union tweeted a photo of a scrum of senior officials clustered in a corridor, some of them crouching on the ground, as they fought back and forth over the details. By late evening – after May had stewed outside the room for four hours – European Council President Donald Tusk delivered the news. She had won a reprieve – but not the one she requested. The extension provides “so many options,” Tusk told reporters afterward. He said Britain will still have the choice of a deal, no deal, a long delay or canceling Brexit. The April date is the deadline to organize late-May elections for European Parliament, a necessary step, EU leaders believe, if Britain is to stay inside the union beyond them. The stuttering sequence of deadlines increases pressure on British lawmakers to cut across party lines to approve some sort of deal. It also gives EU leaders political cover with their own voters if Britain departs without a safety net, since they can say they did everything possible to avoid it.